Lifehouse struck gold in 2000 when their hit single "Hanging By A Moment" went number one and their debut album No Name Face went on to achieve double platinum status. Since their release, and a marketing campaign that found Lifehouse records on both Christian and mainstream store shelves, the alternative rock group has been scrutinized, as much as any band that exists in both realms, to no end. Their latest release Everything, is a DVD that offers all of the band's concept videos and a few live songs that probably won't be ending the scrutiny anytime soon. Everything is an aptly titled project. It opens with the band's six concept videos, beginning with their first, the budget "Hanging By A Moment," and ending with their most recent, the higher end "Blind." The selections from No Name Face are distinctly more restrained and contemplative, while the latter videos seem to fit a lot better within the mainstream market. "Spin" and "You And Me" are both given a more relationship-focused approach while "Breathing" is clearly about spending time with God. The video that has the greatest impact, however, is easily the moving "Blind," which takes a heartwrenching look at adultery through the eyes of a teen who finds out her father is cheating on her mother. Fans of the movie Napoleon Dynamite will definitely recognize this teen as Tina Majorino, who played Deb in the popular indie film. The highlight of the short DVD, however, is the inclusion of the four live cuts. Opening with the worshipful "Everything" from No Name Face, the final three selections are from their most recent self-titled effort ("Come Back Down," "Days Go By," and "You And Me"). The audio is perfect, almost studio-quality, while the video is decent as well. Overall, the features seem rather slim as they end there... no interviews, no commentary, not even an animated menu. With so much that has gone with the band in such a short time, one would think the DVD could be filled to the gills with features. If anything, features from promo DVDs that had been exclusively serviced to press on previous projects would have been nice bonus features. But, unfortunately, the videos and live songs are everything there is to Everything. 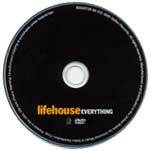 If you're a diehard who has been waiting ever so patiently to own each and every Lifehouse video for your personal music DVD collection, this is it. For those looking for something more than just a half dozen concept videos, there won't be much for you if the live songs aren't enough. For what it is, Everything is a great DVD, but ultimately skimpy on real in-depth features.